A dearth of comprehensive price and sales data and incorrect figures about marijuana commerce have sowed confusion among cannabis businesses in Washington state since regulators rolled out a new traceability system more than a year ago. Cannabis analytics companies that long relied on the data have watched their revenues shrink. Also, the lack of market transparency has put a damper on investments by marijuana entrepreneurs looking to make a play in the state. Jim MacRae, owner of cannabis-focused business intelligence firm Straight Line Analytics in Seattle, said 60% of his consulting fees were tied into the state’s traceability data. A core part of his service was informing clients which Washington retailer was paying the most for a given product and who was paying the least. Another issue involves the fact that state-provided monthly sales reports have resulted in wildly incorrect figures, according to industry watchers. For example, in June 2018, one Seattle-based processor, Prohibition Gold, was shown to have tallied $8.6 million in sales. By contrast, in the months before and after, the company averaged $70,000-$100,000 in sales. “We would have loved to make eight and a half million dollars in June, but that certainly didn’t happen,” said Greg Walters, the company’s managing partner. Florida-based BioTrackTHC was Washington’s seed-to-sale traceability program provider from the start of the state’s legal recreational cannabis program in 2014 until Oct. 31, 2017. During that period, the state provided a monthly data dump of cannabis business transactions throughout the supply chain. Weight and dollar amount of each sale from a grower to an oil producer. A detailed account of each retail transaction. Quality assurance and potency results. David Busby, CEO of Seattle-based data software company WeedTraQR, said he was paid a consultancy fee several times to evaluate the previous traceability data and determine the viability of a deal for a client. One potential investor showed interest in setting up a cannabis transport business but eventually balked. Among other things, the investor cited a lack of detailed 2018 business data, according to Busby. But the data stopped coming as of Nov. 1, 2017. Since then, the Washington State Liquor and Cannabis Board (LCB) has provided only total sales figures, which the businesses themselves offer to the state. MJ Freeway’s Leaf Data Systems has experienced glitches since it went live in February, and a third-party consultancy hired by the LCB found the rollout was rushed by the state and the system needed fixes. The consultancy spread the blame for the issues. But it said much of the fault lay at the feet of the LCB. There are other instances of glitches in the data similar to what Prohibition Gold experienced. 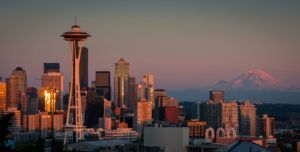 In one case, Grandview-based Sunnyside Northwest had been reporting little to no sales, then suddenly showed a month of more than $200 million, outpacing the average total monthly sales numbers for all Washington cannabis companies by well over $100 million. “Monthly numbers with huge swings from normal sales numbers like that are anomalies,” LCB spokesman Brian Smith said. “That is the number that is reported to us … clearly an outlier and likely operator error,” meaning the state’s position is that the businesses incorrectly reported the figures. He also said the new traceability system is not fully implemented and that Leaf Data Systems’ reporting capabilities are slated for future releases, which means more comprehensive data could be released in coming months. “Currently, the system is working, with some workarounds, for licensing and enforcement, which is our top priority,” Smith said. The system is slated to be fully implemented by late spring, Smith noted. MJ Freeway spokeswoman Jeannette Ward Horton said this type of “reporting is part of an integration” to the Washington state system and is “always done last” as part of the software development. The inaccurate $8.6 million figure last June triggered an audit by Prohibition Gold’s bank, which noticed the number didn’t jibe with what the company was depositing. “We went through a lot of stuff because of that,” Walters said. One silver lining: The incorrect sales figure provided free advertising. Businesses took interest in what appeared to be a company that could process considerable product. Are you kidding? This is the most played down pile of crap I’ve read in quite some time. How much is MJ Freeway paying you? So much for journalistic integrity. This is much much worse here in WA. Way to not talk about the 100s of businesses that have closed, partially because of LEAF? Saying it’s user error? There are literally recordings on social media showing data on inventory changing from a few thousand to over a half million upon refreshing. I’ve heard enough rumors about how close your companies are… but this is a cut into your credibility. True enough though. How does one do their taxes? At both state and federal levels. With all the options out there, I cannot believe that WA chose MJFreeway as their traceability program provider. Didn’t they research all of the problems their POS system had in Colorado in the beginning of 2017 that caused so much turmoil when the system crashed for over a week? It caused many businesses throughout the US millions in lost revenue. I’m not at all surprised by this news at all. a reporter in denver writes about a washington issue caused by a denver software company…suspect. Yeah, Washington’s been a mess since they went with Freeway. Politics can’t drive a large IT project but that’s the fault of the LCB. We haven’t heard why they ditched Biotrack, so knowing how this state loves to hide the truth, I naturally suspect the LCB messed that up as well. This is the same agency who ran the liquor industry here into the ground so now we Washingtonians pay some of the highest liquor prices anywhere. They don’t test for pesticides, which is absolutely ridiculous, and I bet we’ll find just as much lead in our vapes as California found (or worse). Not to mention they don’t allow home growing or farm sales to the public, though I hear that may change. All very frustrating. In my opinion, time for a long overdue housecleaning at the LCB. BioTrack left the LCB citing that the rules we, the industry, work by go against federal laws and they did not want to infringe that upon their legitimate commercial customers. Of course the rules go against federal law and biotrack is still in the cannabis industry in other states. MJFreeway is taking way too long to update the data, to blame it on user error is the worst typical excuse an IT professional uses. Fix it now and help us be credible. I sure hope other nascent industry’s learn a lesson about how politicians can truly screw up a situation. maybe Washington should start a Public Pricing Exchange like in Humboldt California.